*St Ignatius of Loyola, the founder of the Jesuits, is buried under the altar in the left transept. *This church is east of the Pantheon. 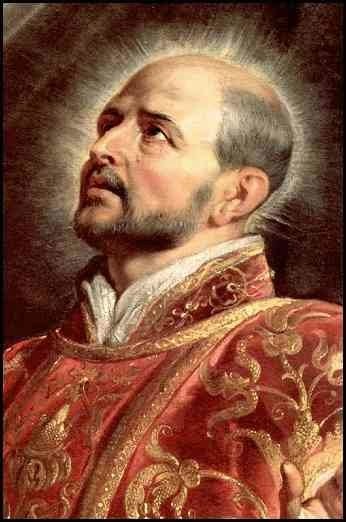 It is dedicated to St Ignatius of Loyola. *The remains of St John Berchmans, the patron saint of altar servers, (d. 1621) rest under the altar in the left transept. *On Christmas night in 1538 St Ignatius of Loyola celebrated his first Mass in this church within the Chapel of the Nativity. At the time of St Ignatius this chapel was located within the confessio in the right transept and housed the five highly venerated pieces of wood from the manger of the Lord. Today this chapel, whose relics have been relocated to the confessio below the Papal Altar, has lost its association to the Nativity. *On April 22, 1541 St Ignatius of Loyola and five companions made their profession of solemn vows in front of a 13th century icon of Our Lady which is now found in the Blessed Sacrament Chapel of this church. The crucifix in this chapel is also of note as it is said to have spoken to St Bridget in 1370. *St Paul is also buried in the confessio in the main body of this church. Above his tomb are the chains that were used to imprison him prior to his martyrdom. These chains were placed in this prominent location in 2008.